Joan of Arc belongs to that select club of historical figures (Shakespeare, Napoleon, Lincoln, Churchill) who are so endlessly fascinating that new biographies appear on a virtually annual basis. And this is to say nothing of endless literary and artistic portrayals—in Joan’s case, by everyone from Shakespeare to Shaw to The Simpsons. Of course, membership in this club confers the dubious privilege of having every successive age project its fantasies and obsessions onto the screen of your personality. Joan, in the 580 years since she came to fame, has been hero and villain, primal innocent and cunning manipulator, nationalist and universalist, feminist and anti-feminist, rational leader and hysterical madwoman, straight and gay (and bi and transgender)—not to mention heretic and saint. Actual historical evidence rarely resists the force of a writer’s longing. In Joan’s case, the evidence is copious, but extraordinarily tricky. While it was not altogether uncommon for teenage peasant girls in the late Middle Ages to have religious visions, it was rather more unusual for them to advise kings and lead armies into battle. From the moment the teenage Joan and her visions appeared at the French court in 1429, she attracted enormous attention, which only increased as she helped guide French forces to a string of victories over the English. This was followed by King Charles VII’s formal coronation—a decisive moment in the Hundred Years War. And then, in a stroke of excellent luck for her biographers (if not for Joan herself), she fell into the hands of the single institution that compiled more complete records of intimate lives than any in history up to that point: the Inquisition. In an effort to prove Joan guilty of heresy, the inquisitors interrogated her, and numerous witnesses, in remarkable detail about her actions, her visions, and her beliefs. Nor was this all. Some twenty years after Joan’s burning at the stake as a heretic in 1431, King Charles persuaded the pope to authorize a new trial, which nullified the previous verdict, and generated additional testimony. Taking all these sources into account, we probably know more about Joan than about any other medieval person—indeed, far more than about later figures like Shakespeare. Still, many of the contemporary accounts attempted to squeeze Joan’s life into the shape of pre-existing religious narratives. And debates have long raged issues such as whether the Latin record of the original trial was altered by the presiding bishop in an attempt at self-justification. Despite the massive popular interest in Joan (or perhaps, because of it), serious historians have tended to avoid the minefield of her life in recent years. For these reasons, Larissa Juliet Taylor’s biography performs a real service. Taylor has read the evidence with scrupulous care, absorbed all the most recent scholarship, and written a clear, well-documented narrative that follows Joan closely through the different stages of her short existence. Taylor evaluates the various controversies judiciously, and comes to balanced, sensible conclusions. (She makes a good case, for instance, for trusting the Latin trial record). The book is the most accurate, up-to-date account we have of Joan, and it will likely remain the standard critical biography for some time. Taylor’s concern is to dig the “real” Joan out from under the thick layers of demonization and (literal) sanctification. This is not a postmodern biography presenting the collage of a “fragmented self.” Joan emerges from its pages as a coherent and sympathetic character: “an all-too-human young woman of great conviction and belief in herself and France.” Taylor particularly emphasizes Joan’s “headstrong” and rebellious qualities, and the verbal agility that she deployed—first to convince her own side of her mission, and then, in English captivity, to taunt and spar with her enemies. If Joan had a flaw, Taylor suggests, it was an increasingly arrogant tendency to believe her own astonishing legend. Taylor does little to enliven her prose. “Joan’s childhood was fairly normal,” she writes flatly. “Joan approached life actively.” The book generally fails to bring out the color and texture of fifteenth-century French life. And where a more confident writer would let Joan’s incredible drama speak for itself, Taylor must repeatedly tell us how incredible it was: “Joan of Arc is one of the most remarkable figures in history.” Did we doubt it? Still, with Joan, even a straightforward narrative like Taylor’s grips the reader. The more serious problem with the book is that Taylor, scrupulous as she is, cannot resist the usual tendency to make Joan her own contemporary. Biographers need not actively distort their sources to fall into this trap. They need only put the most weight on those particular pieces of evidence that jibe best with their own assumptions about how the world works–to see subjects speaking most “clearly” when they seem to be speaking most directly to our own sensibilities. Biographers can guard against this tendency by setting their subjects firmly in context, and struggling to “get” precisely what seems strangest about them. But Taylor, by focusing so intently on the narrative of Joan’s life, generally misses this opportunity. Thus, despite acknowledging Joan’s taste for battle, Taylor tries to separate her from the ugly details of war. Joan “may have already left for Orléans before the worst atrocities occurred,” Taylor speculates, without evidence, about the bloody sack of Jargeau by French troops. She puts great emphasis on Joan’s dedication to chivalric culture, which cast a veil over the actual act of killing, and so jibes with our own horror of combat. But the chivalric code was routinely violated (at the battle of Agincourt, both sides slaughtered helpless opponents). 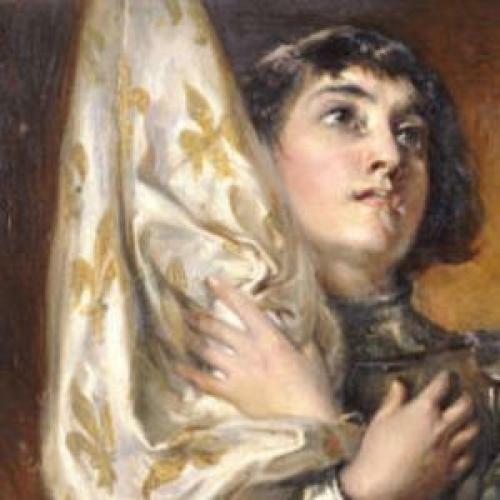 Why assume Joan violated it less than other knights of the period? Taylor also ends up, despite due attention to Joan’s “voices,” oddly downplaying the Saint’s religious motivations. She draws attention to Joan’s expressions of confidence and determination, and then comments (repeatedly) that Joan “believed in herself.” But Joan didn’t believe in herself. She believed in God, and in her own role as God’s agent. Taylor points out, quite accurately, that Joan did not engage in the elaborate fasting and self-mortification typical of many female medieval religious figures—again something that makes her seem less strange in our eyes. But Joan nonetheless shared those women’s goal of immolating their individual selves so as to become pure instruments of the divine will, which is about as far from our Romantically-inflected notions of “believing in oneself” as can be imagined. Finally, Taylor wants to make the Maid into a Nation-Builder: “Joan played a major role in the creation of France.” Of course, Joan spoke with great passion and eloquence about France, fought to save the French monarchy, and is now a French nationalist icon. But the argument that she played a key role here falls apart on closer inspection. France as a kingdom and a battle-cry existed centuries before Joan of Arc. But the idea of France as a homogenous, unified nation-state would not appear for several more centuries. Taylor, in any case, fails to back up her claim with any systematic discussion of nationalism. Readers looking for a lucid, reliable narrative of Joan’s life will do very well with this book. But readers hoping to understand Joan’s historical significance will need to wait for a different sort of book, one that does not hesitate to confront the past in all its utter strangeness. David A. Bell, a New Republic contributing editor, is Dean of Faculty and Mellon Professor in the Humanities at Johns Hopkins.